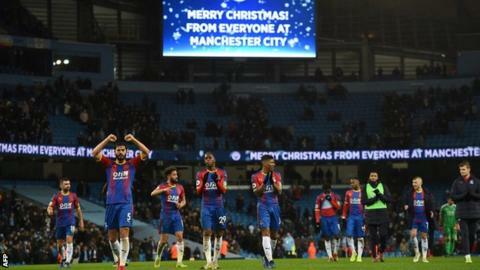 In a season during which there have been precious few shock results in the Premier League, Crystal Palace’s win at Manchester City felt practically seismic for everyone at Etihad Stadium. From the jubilant reaction of the travelling Eagles fans, who could barely believe what they were watching, to the gobsmacked silence of the City fans so used to seeing their side steamroller the opposition, this was a reminder of how sometimes even games featuring the top-flight’s leading sides do not follow the expected script. A free-scoring City team that came into the game with the only 100% home league record in the top six tiers of the English game were toppled by a team that had not beaten them away for 28 years and had lost 5-0 here on their past two visits. Not only that, Palace did it by scoring three times, and after going a goal down. We are used to seeing teams crumble after going behind against this City team, who were the only top-flight side not to drop any points from a winning position home or away in 2018-19 – until Saturday. But throw in a wonder goal from Andros Townsend, some horrendous winter weather and also a wonderful defensive display from the Eagles and you have the recipe for a memorable upset, and one that might just help to play a decisive part in this year’s title race. As City boss Pep Guardiola would bemoan after the game, two Palace shots led to two goals in the first half, but it was definitely a case of quality over quantity for the visitors. The City fans were still on their feet singing “stand up for the champions” until just before Jeffrey Schlupp equalised from the edge of the box, and that setback was still sinking in when Townsend’s sensational volley sent shockwaves through the stadium soon afterwards. Townsend put it perfectly when he described it as “definitely the best goal of my career, against the best side I’ve ever played” because it was a strike that seemed to knock City out of their stride. It affected the home side’s players as well as their fans – with City unable to up their tempo or quality in the final third in the remainder of the first half – with the effect repeated when Luka Milivojevic extended Palace’s lead from the penalty spot just after the break. You can almost understand why. Seeing City behind at home is something their fans are simply not used to under Guardiola, who before Saturday had lost just two out of 48 league games here since taking charge in summer 2016. It is not something this current side have experienced often on home turf either. As Guardiola explained afterwards, they are used to waiting to break down stubborn opposition before going on to win fairly comfortably – most of the time. That did not happen against Palace – less than eight minutes after Ilkay Gundogan gave them the lead, City were behind – never to recover. Roy Hodgson’s beaming smile after the game said it all – his Palace side had delivered their best performance of the season, on what was – on paper – their toughest assignment. Guardiola, though, was right when he pointed out afterwards that City were not out-played by Palace – just undone by classic counter-attacking football. It is obviously not the end of City’s title hopes either. While this defeat means they will trail Liverpool by four points on Christmas Day – compared to the same time last year when they were 13 points clear at the top – it would clearly be foolish to write them off, especially before the halfway stage of the season. He is right – there are still five months of the campaign remaining – but while this home defeat was damaging, if City lose their next game at the Etihad then it will be a lot more decisive. Liverpool are the next team in town on 3 January, so this was not a good time to show that fortress Etihad has any weak points. If Palace can exploit them, Jurgen Klopp’s side will be confident of doing likewise.